Your customer relationships are the driving force of your business. By offering a complete view of every customer touch point across your sales, marketing, customer service and support teams, Infor CRM (formerly Saleslogix) enables you to maximise the impact of every interaction - across the entire customer lifecycle - whether in the office or out in the field. The best thing about Infor CRM (Saleslogix) is that it is built for your business. Industry-specific capabilities, deep integration and flexibility. You have control in how you deploy, use and pay for your solution. Infor CRM (Saleslogix) is the platform of choice for companies strategically focused on customer engagements. Robust functionality, deep integration and high flexibility of use and deployment result in a solution that works just the way you need it to. Infor CRM Mobile extends rich functionality to smartphones and tablets, giving your mobile workforce a strong competitive advantage. Interactions with native device features such as mapping, dialing and email further streamline the mobile user experience. Receive over-the-air updates automatically at no additional charge. Rich customer profiles and sales productivity tools help users identify opportunities and streamline sales activities. Simultaneously, sales management tools, analytics and proactive alerts drive accurate forecasting as well as effective team and territory management. Best-practice process automation recommends and performs winning actions that drive results. Attain unparalleled flexibility and control in how you deploy, use and pay for your CRM solution. Cloud, on-premise, hybrid and mobile options accommodate your business needs. Buy, finance or subscribe while maintaining full control of your data. Select from and mix multiple license types to lower total cost of ownership and align diverse user requirements. Software should look as good as it works. Infor CRM engages every user, across all teams, with a user experience that's designed to help users work faster and smarter. Build your sales funnel. Build your forecast. Build your business. Successfully compete and win, in your industry, with Infor CRM (Saleslogix). With the right tools to help you effectively manage your sales pipeline, drive opportunities to a close and have visibility across your team’s performance. Manage leads, opportunities and activities from anywhere—at the office, on the road or on a mobile device. Deploy and track your marketing campaigns using Infor CRM (Saleslogix). You can target a chosen market segment with a direct campaign, as well as track its effectiveness. From concept to conclusion, using reporting and analytics, you can monitor the responsiveness to your campaigns and track the Return on Investment (ROI). Enable service and support teams to resolve customer issues and deliver a quality customer experience that builds loyal and profitable customer relationships. Easily find resolutions to problems, offer convenient self-service options and get reports that inform you if issues are being resolved in a timely manner. Insight that drives your bottom line. 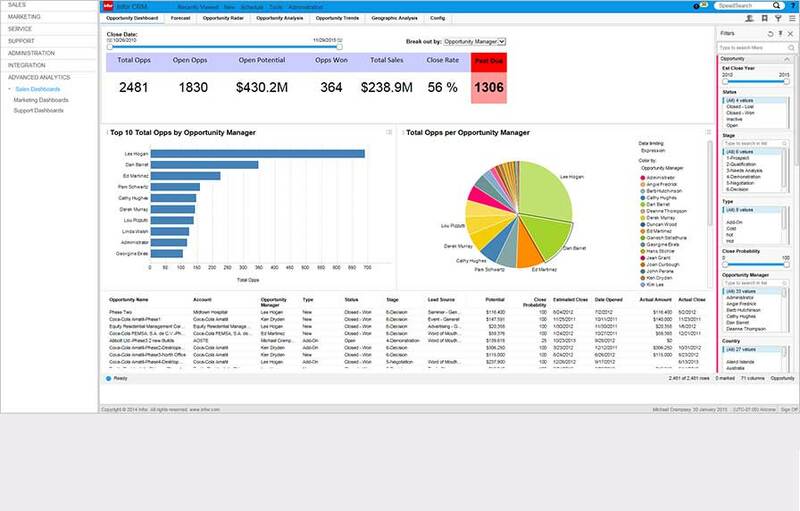 Infor CRM (Saleslogix) reporting and analytics capabilities are key to unlocking the power of your data and enabling you and your team to be proactive in your daily goals. Powerful analytics of business and team performance help increase effectiveness and maximise organisational and customer intelligence. From the out-of-the-box CRM reporting and list management capabilities to interactive analysis tools and specialised business intelligence, you get the tools that empower analytics-based decision making at all levels. Your solution where you need it. Infor CRM Mobile delivers rich CRM functionality across multiple mobile platforms through a browser-based application that is easy to deploy, customise and manage. Infor CRM Mobile provides robust capabilities to those who spend most of their time on the road or in the field. They can edit all account and contact information, view KPIs, access charts, and keep track of their schedule and tasks. Infor' CRM's flexible and robust configuration creates dynamic, personalised user experiences. Advanced customisation enables unique requirements by user, team, company, and industry. Features include integration, sophisticated security, advanced process automation and flexible deployment options to meet your unique business requirements. Infor CRM provides robust and flexible solutions in over 70 industries. See how Infor CRM delivers specialised capabilities for your industry from day one. Please contact us if you want further information or to discuss your Infor CRM requirements. The post Build a CRM strategy that will engage your customers appeared first on The QGate Blog. The post GDPR and CRM systems appeared first on The QGate Blog.